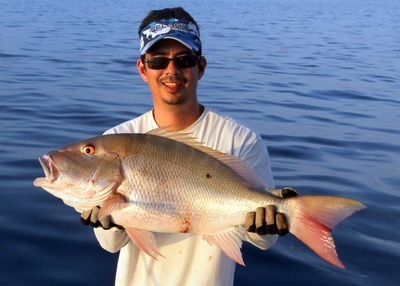 Not a bad catch for just the author fishing over a couple of days in the Dry Tortugas. Many fish released as well. Headed down to Key West on June 24 ready to do some fishing. I had never been there before and was excited to get some new species. Unfortunately the weather was not cooperating and I had to sit at the dock June 25, 26, and 27. Finally on the 28th I was able to get out and fish. 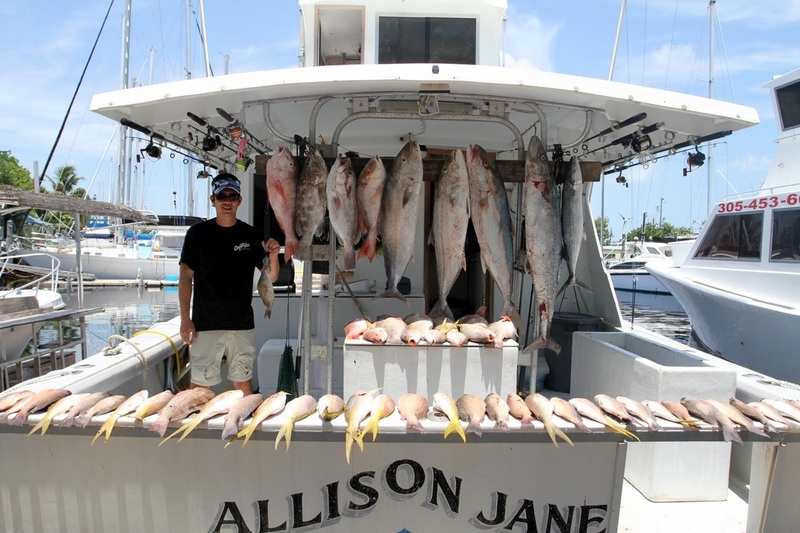 I hopped on the Allison Jane out of Key West with Captain Steve Sanchez. Captain Steve has been fishing there his whole life and it showed. On the way out to the Dry Tortugas we stopped at some wrecks and threw jigs at permit. 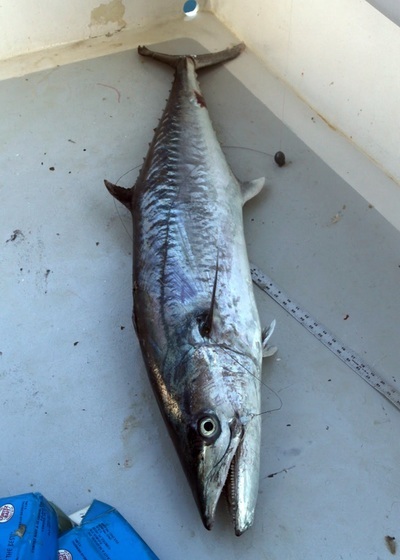 We saw tons of permit and had several chase the jigs but no hookups other than barracuda. 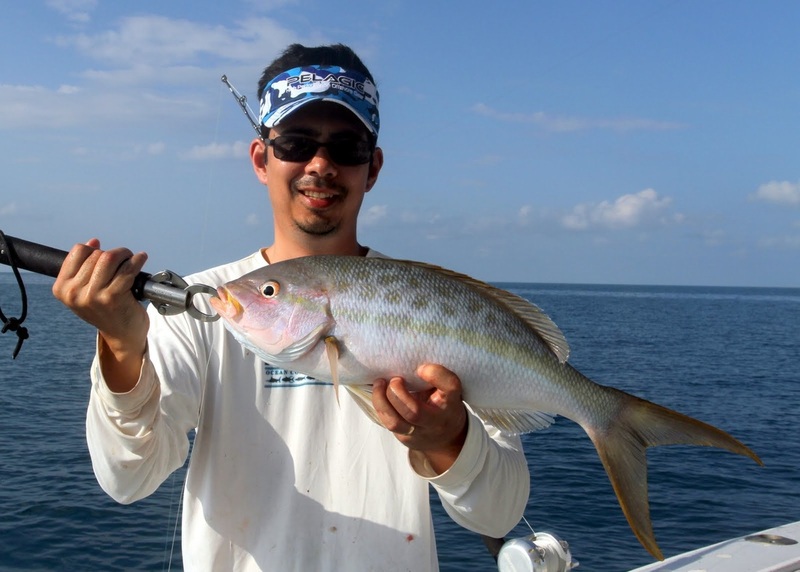 We made it out to the Tortugas near dusk and started jigging with bucktails for grouper. 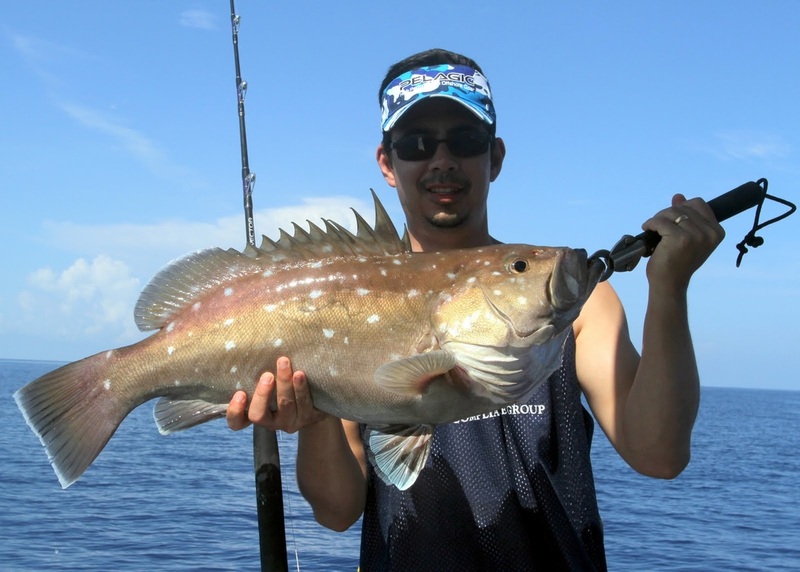 I had never really done this type of fishing so it took a little time to get the hang of it, but in a little while i was nailing the red groupers. I got a couple of keepers and a lot of shorts and then we moved to a couple of other spots for more reds. Suddenly something much heavier nailed the bucktail and took off. I was using a relatively light rod and reel but after a long battle was able to bring up a 55lb Goliath Grouper which was released. Cool fish. Finished off the night with a 40lb Amberjack caught on a live pinfish. Friday morning I did not get up as early as I should have but was still up in time to catch some red groupers and a 6ft nurse shark on jigs and then Amberjack of 20, 40, and 50lbs on live pinfish. 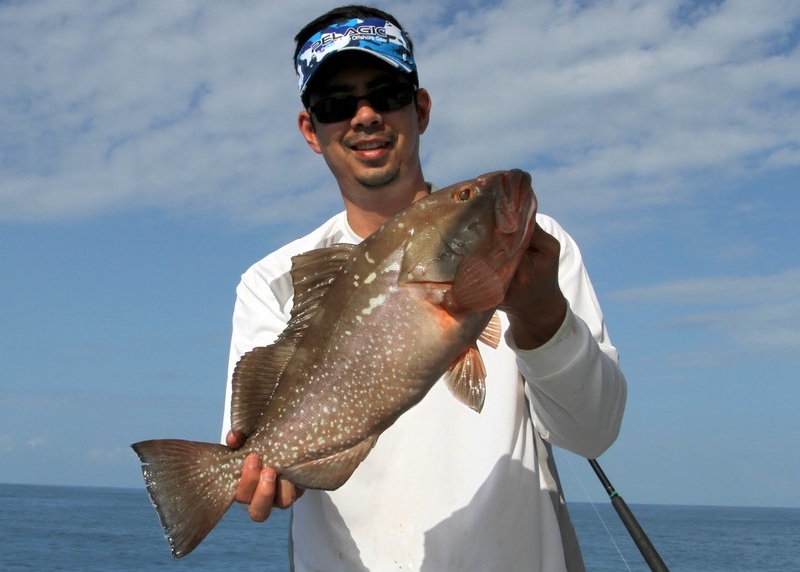 There was a long midday lull in the bite but in the afternoon I got a bunch of short red grouper in the 16-18inch range along with some really big yellowtail up to 23 inches. In the evening we finally found the mutton snapper and I got a 14lber, a 12lber, and an 8lber. 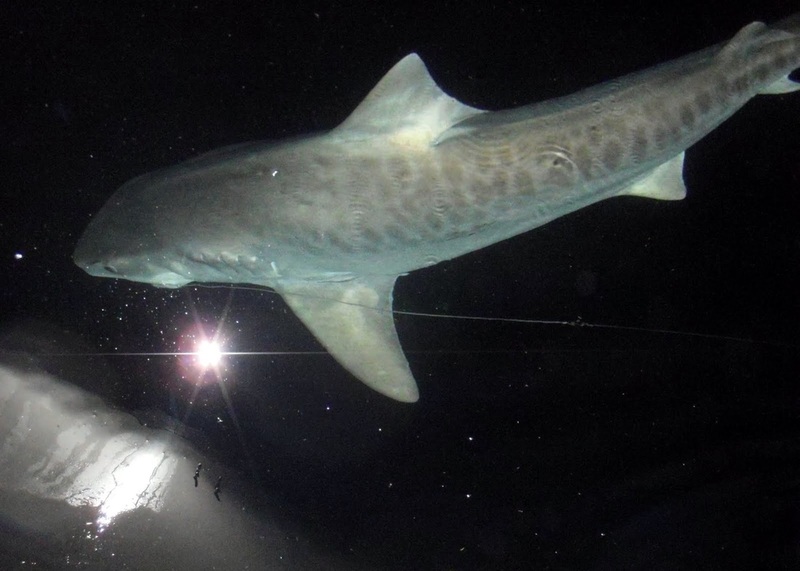 There was a lull after that but in the evening a big shark swam into the lights. The captain quickly recognized that it was a Tiger Shark and started throwing out chunks of fish to keep it around. Luckily I had a heavy rod rigged up so I put a big baitfish on and threw it out and the shark ate it after circling it once or twice. I set the hook and luckily it got hooked right in the corner of the mouth and did not bite through my mono leader. After about a 30 min fight in which it pulled me around the boat a couple of times, I was able to get it to the boat. We took a bunch of pics but since it was nighttime not many of them turned out. Oh well, it was an awesome experience. 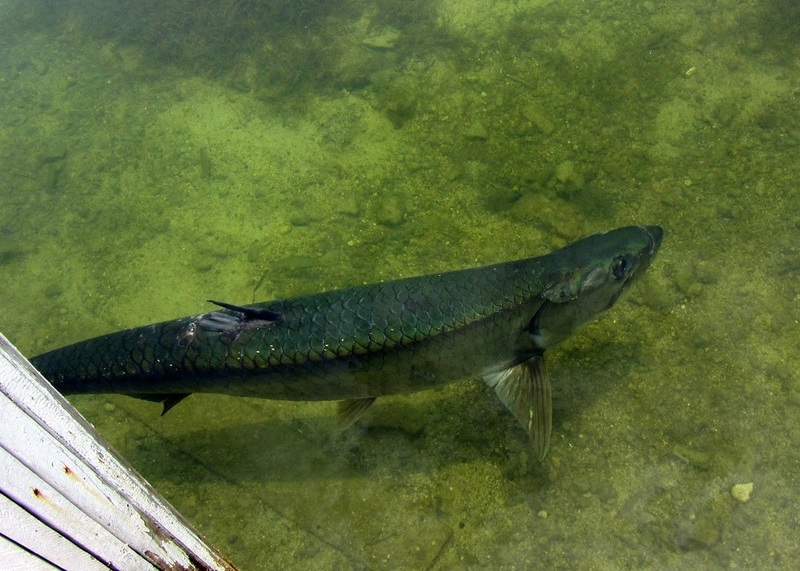 The next morning I got up a little earlier and the cero mackerel could be seen chasing baitfish on the calm surface. Occasionally one would leap 10ft in the air. I tied on a Zara Spook plug and got lots of hits working it fast. After getting a couple in the boat I hooked one that got annihilated by a big kingfish. I dropped a live goggle eye down that I had jigged up the night before and it immediately got grabbed. As soon as I set the hook the fish bit through the heavy mono leader. I had a length of 60lb wire handy so I rigged that up and sent down another goggle eye that was immediately inhaled and my leader got severed again immediately. I looked around and found a 100lb wire, rigged that up, and finally stayed hooked up. 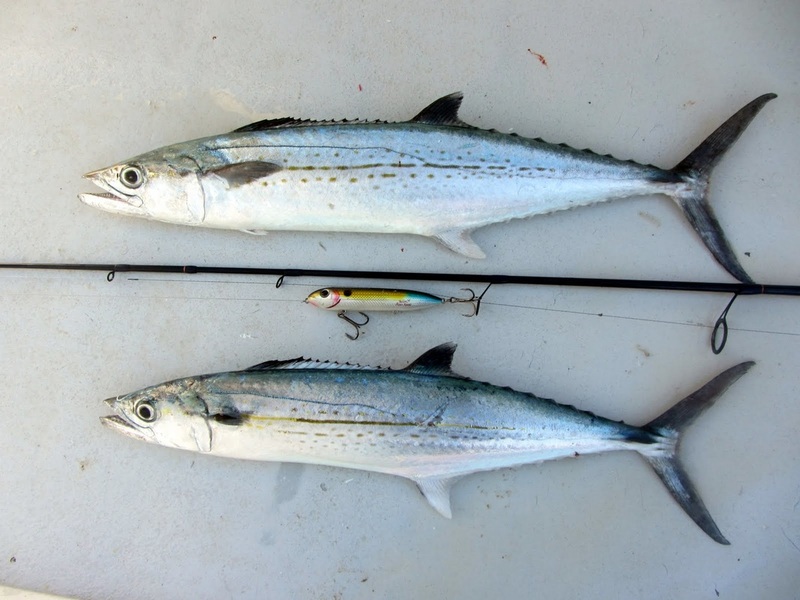 The heavy fish took off over 100 yards of line against a heavy drag on its first run and after a 10 min fight I had a 50lb+ Kingfish next to the boat. As the captain and mate were still asleep I managed to gaff it with one hand while holding my rod in the other and pull it over the side. What an awesome fish. 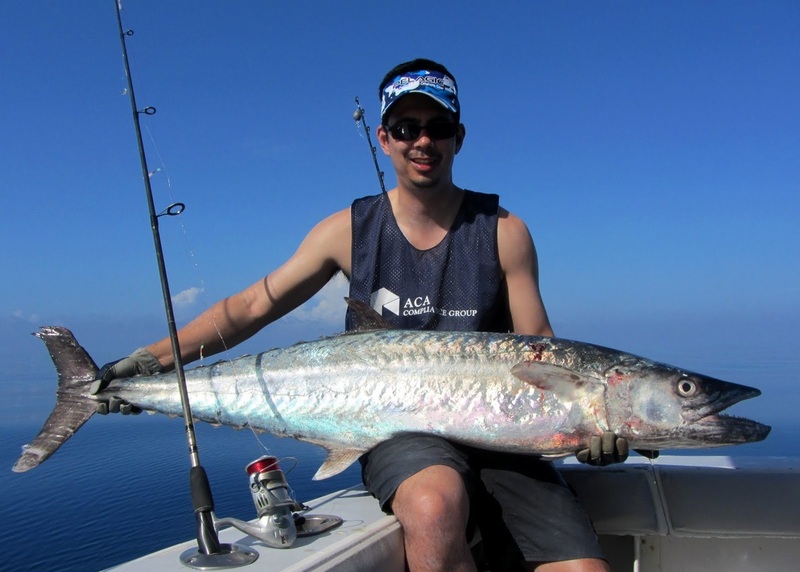 By that time the sun was a little higher and the Kingfish stopped biting although I did get a 36 inch Cero Mackerel on another live bait. 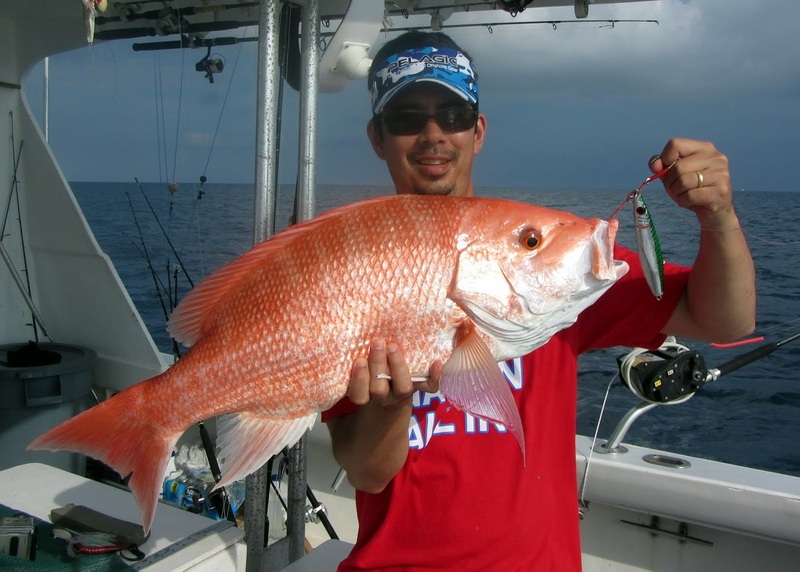 Saturday afternoon the reef fishing was slow so we went offshore to do some deep dropping. I hand reeled up a 14lb Snowy Grouper from 500 feet and then used the electric reel to bring up a Golden Tilefish. In the evening we anchored up and absolutely slayed the Mangrove Snapper and Yellowtail Snapper. There were some big 3-5lbers and every bait got eaten immediately for a couple of hours. Those things put up a great fight on light tackle. A couple of them got sawed off on the way up but i was unable to hook whatever was eating them on the live baits I put out. The next morning I was unable to hook anything on the live baits I put down so we found a wreck in 200ft on the way back home. I sent down a metal butterfly jig and started working it and hooked up a beautiful 16lb red snapper. 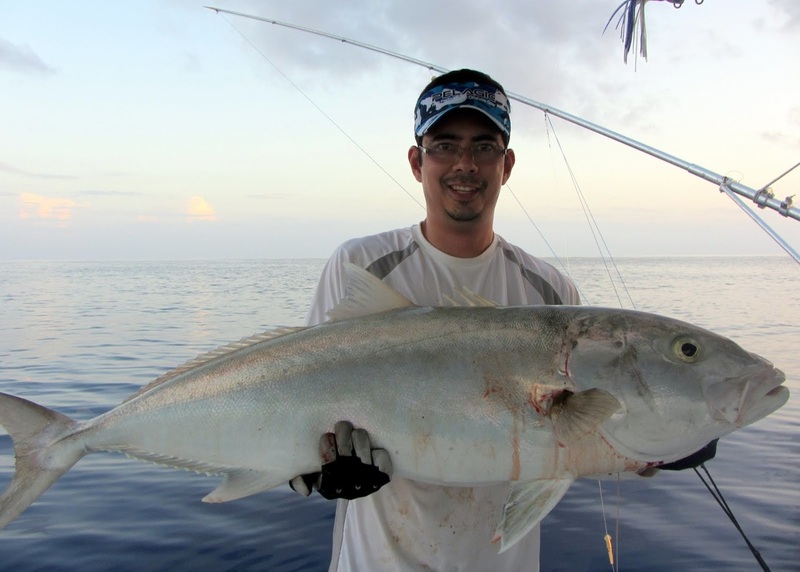 I then hooked 3 large skipjack tuna on the jig before we called it a day and headed for the barn. We didn't hit a lot of wide open bites, and the dead calm weather probably hurt the bite a bit, but we moved around and tried a lot of different things and ended up with a full fish hold. I felt pretty good about the trip on the way in, but I felt really, really good about it when we got to the dock. Another boat was getting in at the same time that had also been fishing the Tortugas. I think they stayed out a little less than we did, but they had 6 guys and combined they had just a small handful of fish. I would like to attribute the difference in catch to my amazing fishing skill, but really the credit goes to the captain. I don't want to disparage the other captain, but that captain just did not have the same level of experience as Steve Sanchez. The pics say it all. That guy really knows his stuff. If you ever want to fish the Tortugas, I highly recommend Captain Steve. I really respect the fact that he did not take me out in the bad weather and instead waited to make sure I had a good trip. 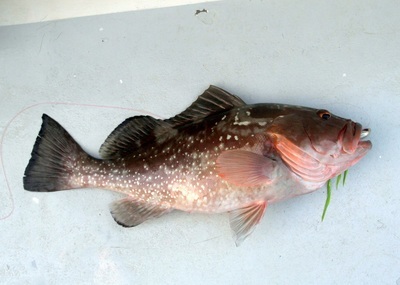 You can look him up at:http://majesticseascharters.com/.